Today must be a two-for day! The prior posts on Israeli Couscous with Sugar Snap Peas & Asparagus was a teaser for the remainder of our dinner last night. Did you notice the last photograph on the post Israeli Couscous with Sugar Snap Peas & Asparagus? It showed the complete meal, something like the above photograph but Baby Lady & I can no longer eat 10 oz of tuna (it’s that aging thing) so we split ours in half. This post is really about the totality of the meal. As you should know by now, I love tuna, especially Big Eye Blue Tuna. I buy it fresh in bulk, vacuum seal it, freeze it and eat it as quickly as possible. 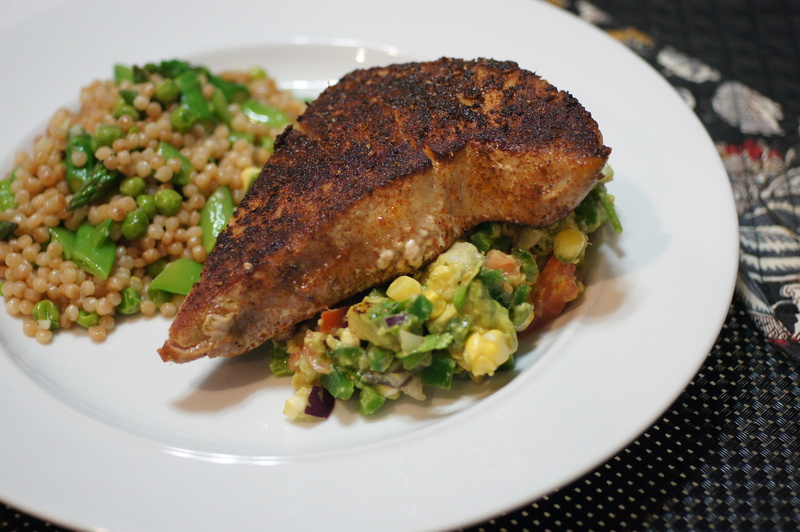 I have also mentioned this beautiful earthy ancho chile rub. Last night’s meal was a meal in complete harmony. You had the wonderful meaty flavor of the tuna coupled with the earthiness and spice of the ancho rub, the creaminess, spice and acidity of the avocado salsa with the floral component of the cilantro, and the nuttiness and soft chewy texture of the Israeli couscous with the tang of the lemon, crunch of the al dente veggies, and sweetness of the corn and sugar snap peas. What a wonderful meal! I just had to share the whole meal. Husk corn and remove kernels from cob. Notice, Baby Lady does not grill or roast the corn. She likes its crunchy texture and natural sweet flavor. It goes beautifully with the meal and this salsa. Baby Lady uses a neat trick to cut the kernels from the cob. Most people stand the corn on end and cut downward which results in kernels going all over the kitchen. 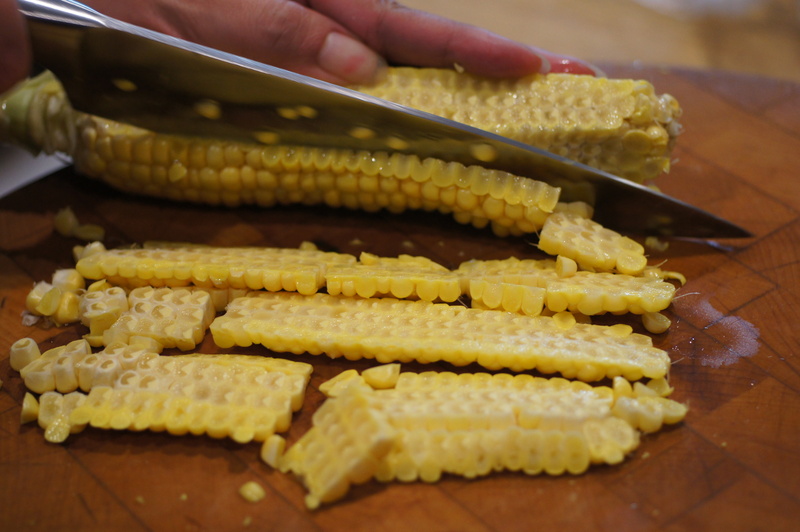 Baby Lady, instead, lays the corn on its side and cuts the kernels like you would slice a zucchini lengthwise. No hassle, no mess. Why people stood the corn on end is beyond me as you don’t cut many things that way, unless you’re Baby Lady dicing a jalapeño but that is the next portion of this story. Put all the veggies BUT the avocado into a mixing bowl. 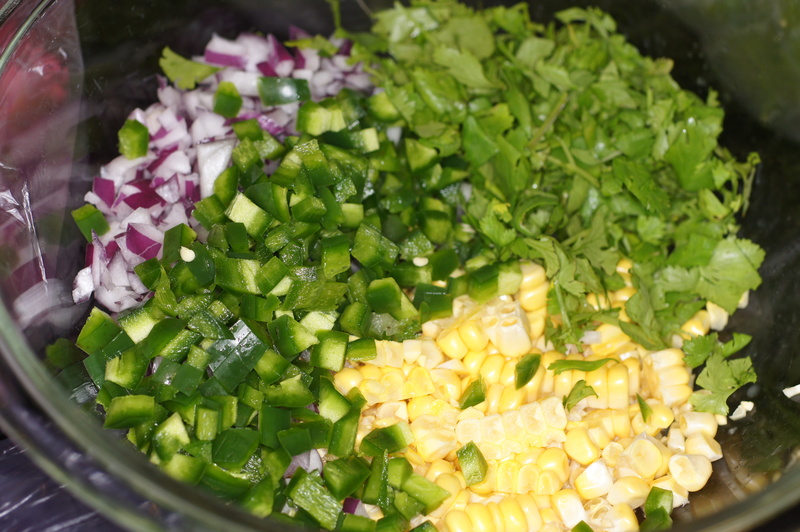 Add the minced garlic, lime juice and season with salt and pepper to taste. Toss to incorporate. 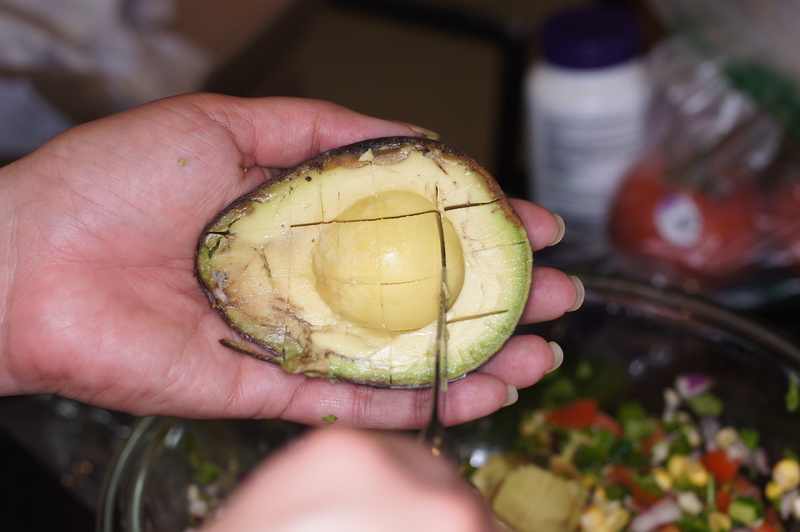 Now, slice an avocado in half, pit and score the flesh in large pieces (1/2 inch) because you want a chunky salsa. Using a spoon scoop out the meat of the avocado and put in the bowl. Repeat process with the other half and the other avocado. 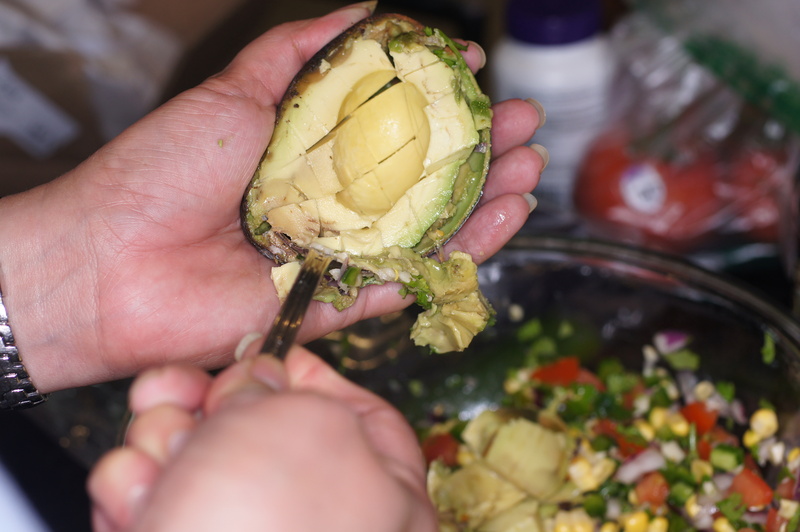 Once the avocado is completed, gently toss the ingredients to incorporate. 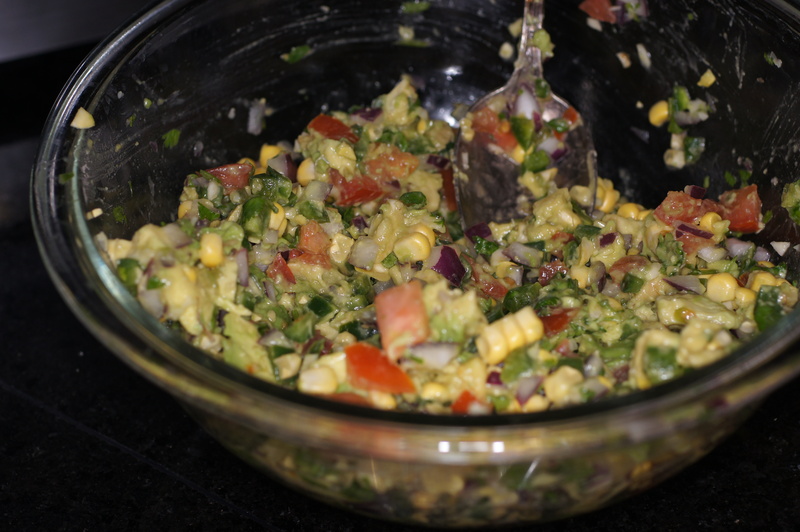 You do not want to mash the avocados into a guacamole. Make the rub (recipe found here), or if you’re like me you have some in the pantry, so get it out. Liberally dust the tuna with the rub on both sides. Heat a heavy bottom skillet (preferably cast iron) on high heat. When hot, add the oil and immediately slide the tuna steaks into the pan away from you. Because you are searing the tuna you want very high heat. For this purpose I use my wok burner at 17,500 BTUs and my cast iron skillet. If you don’t have a high intensity burner, put a large lid or another skillet on top of the other skillet. This focuses the heat downward on the skillet as opposed to dissipating the heat upward. This will get you a very, very hot surface. Make sure you have a skillet designed for this as you can actually warp the skillet. 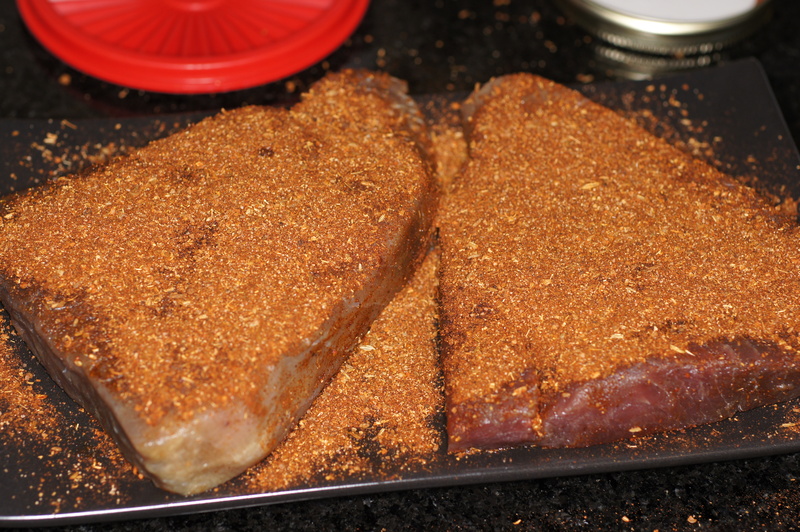 With very high heat, the tuna will sear on the outside in 30 – 45 seconds and form a beautiful crust. 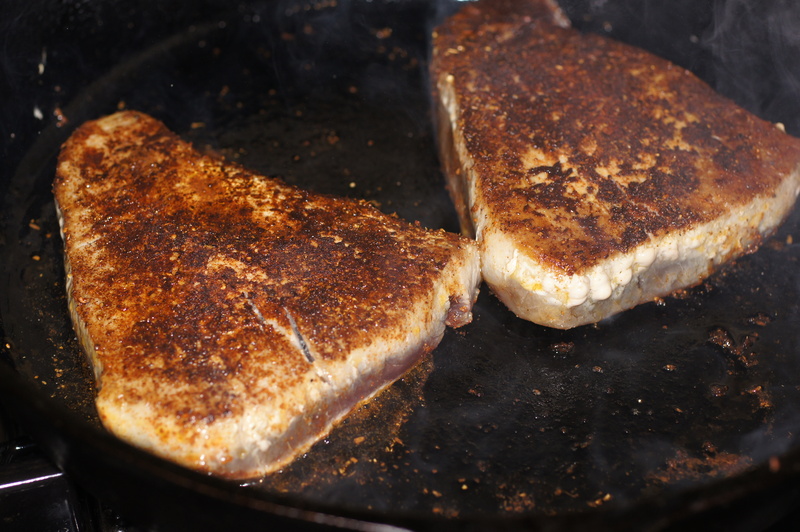 After 30 – 45 seconds, turn the tuna and sear the other side for another 30 – 45 seconds. 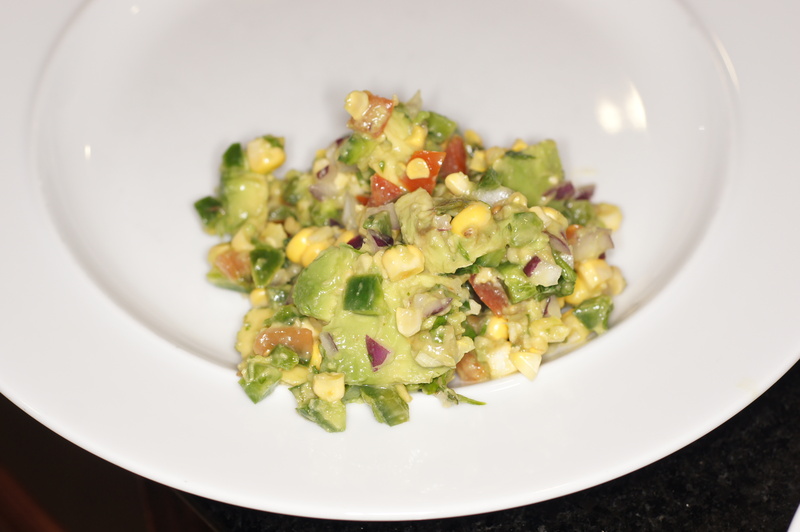 To Plate: Take a generous amount of the avocado salsa and place on the plate in a nice mound. 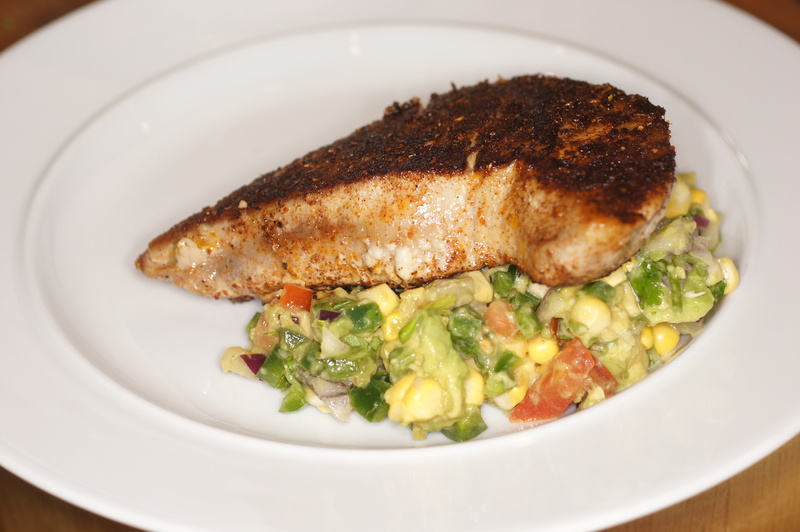 Place one of the seared tuna steaks on top at an angle giving the dish vertical structure. 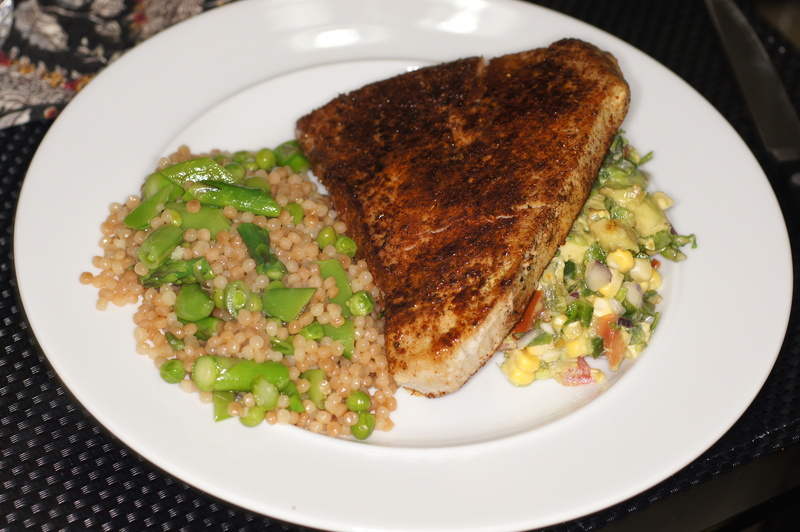 Add the Israeli Couscous with Sugar Snap Peas & Asparagus on the side. Serve & Enjoy! I was just chopping my corn last night end up and thought that there must be an easier way to do this! Yes there was a mess. 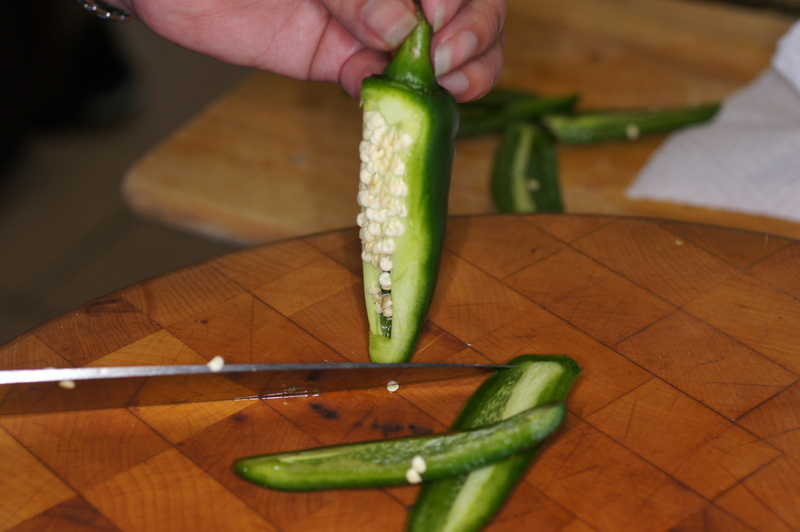 And standing a chili end on seems so obvious now that I see it, and you need a good sharp knife! Perfect and timely for my chilies. Interesting menu combinations. Like the spices in the ancho rub. Let me get a pen and paper!